Speakers: Yevhen Fedchenko (StopFake), Maxim Eristavi (Atlantic Council), Giedrius Sakalauskas (Lithuanian Elves), Oleksandra Tsekhanovska (Ukraine Crisis Media Centre), Vitaliy Moroz (Internews Ukraine). Moderator: Volodymyr Yermolenko (Internews Ukraine, UkraineWorld). Venue: Fairmont Grand Hotel, Kyiv; 1, Naberezhno-Khreshachatyts'ka St. 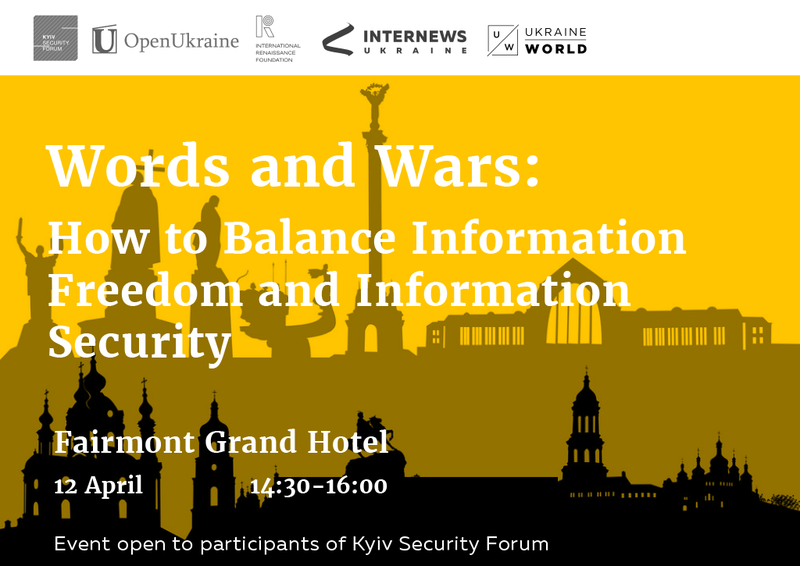 Event is available to participants of Kyiv Security Forum. Freedom of expression and freedom of information is the key value of democratic societies. Attack on these freedoms is always the first sign that democracies are under threat. However, today democracies are facing another challenge: abuse and distortion of freedom of information, when information is turned into a weapon in information wars. Authoritarian opponents of Western democracies are using opportunities provided by freedom of speech to turn democracy against itself. While democracies are in danger, they should protect themselves and protect freedoms they are based upon. They have, furthermore, to look at information not only in terms of freedom but also in terms of security. How to find this difficult balance between freedom and security in the information field? How not to become a victim of two opposed threats: defenselessness and new authoritarianism? What is already done and what should be done to find this balance? The Kyiv Security Forum is an annual event that acts as a platform for high-level discussion on relevant matters of national security as well as security in the Black Sea region, Europe and globally. It was established by the Arseniy Yatsenyuk Open Ukraine Foundation in 2007. UkraineWorld is an information and networking initiative launched by Internews Ukraine to improve knowledge about Ukraine and understanding of Ukrainian developments among the international audiences. The initiative is implemented by Internews Ukraine under support by Internews Network (programme U-Media funded by USAID) and International Renaissance Foundation.